Now, we know that having a little tipple every now and then is a great way of relaxing and sometimes we just don’t want to waste money going to a bar somewhere because there’s no place like home, right? Here’s where a bar cart comes in handy, when you want to entertain at home or just as a nice display spot for your home. Nothing says glamorous more than a gilded bar cart that is fully stocked with your entertainment essentials. Not only can you have a party at a moment’s notice but you can make it look pretty by decorating with some beautiful flowers too. This versatile bar cart can be used for so many purposes from a classy addition to the living room for entertaining or just for special occasions like a girl’s night in depending on how you style it. Otherwise, it can even be used as a convenient coffee table in your home as well. Don’t underestimate the beauty of thrift store finds such as this weathered looking bar cart here. When filled up with your essential entertainment needs, it looks really inviting and works really well with your home decor. This sturdy bar cart is perfect for any spur of the moment of party at your home and when not used for entertaining, it is spacious enough to be used and store a few other items as well. You can keep your items organised with the use of some vintage looking trays too. This elegant looking bar cart is perfect to glam up your home with its beautiful shiny bamboo motif that really makes it glamorous. The wooden elements also makes it look more warm and inviting. Want to make your home more whimsical and pretty? 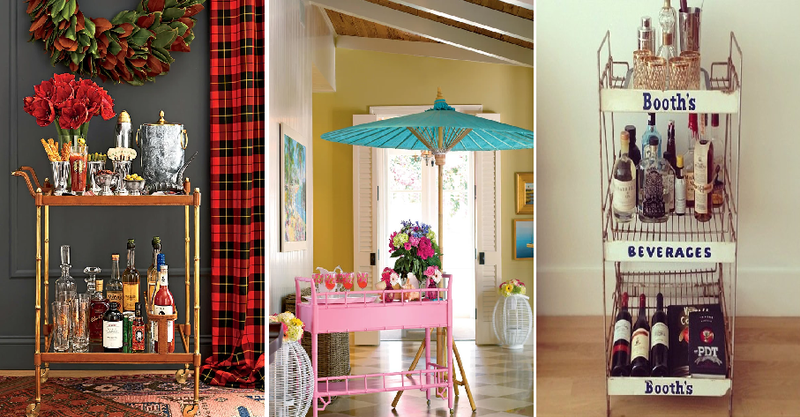 Then this lovely bar cart decked out in a bright pink colour would definitely be a great addition for your home. You can even jazz it up even more with some colourful decorations. If you don’t have much space then you can consider getting a small and portable bar cart that just nicely into a little corner of your home. Keep it fully stocked up and you can be sure that your home is always ready for entertaining. A bar cart doesn’t have to just be a place to store your all drinks paraphernalia, instead you can use it for other purposes as you see fit. This time, this simple bar cart is perfect for a storing your snacks and desserts. Inject some style into your space with this timeless and chic bar cart that fits a modern space. You can even use it for an outdoor party or to serve drinks inside the comfort of your home.